WASHINGTON, Oct. 9, 2018 /PRNewswire/ -- Upskill, a leader in enterprise augmented reality (AR) software, today announced Skylight for MicrosoftHoloLens is available for public early access in the U.S. Enterprises can now take advantage of mixed reality experiences on the same Skylight AR software platform that also supports assisted reality and mobile devices, at no additional cost. Multi-window Viewing: Simultaneously visualize, resize, interact with an cross-reference numerous sources of content in one, large screen. "Our customers see augmented reality as the force multiplier that allows them to fully realize the potential of their workforce and digital investments," said Brian Ballard, Upskill CEO and co-founder. "Skylight for Microsoft HoloLens will serve as the foundation that delivers the latest advances in visualization, cloud computing and artificial intelligence in a mixed reality environment." 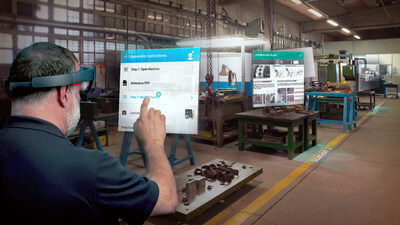 Terry Farrell, Director of Product Marketing, Mixed Reality, Microsoft Corp. said, "As adoption of Microsoft HoloLens continues to rapidly increase in industrial settings, Skylight offers a software platform that is flexible and can scale to meet any number of applications well suited for mixed reality experiences. With Skylight for HoloLens, hands-on workers are provided with the ability to interact with content and information in the most natural ways possible, leading to a safer, more efficient workplace." To learn more about how you can participate in the Skylight for HoloLens early access program, please contact info@upskill.io. Upskill is the market leader in enterprise software for augmented reality devices and experiences in industrial settings. Trusted by some of the world's most well-known companies, including The Boeing Company and Accenture, both also investors, our industrial platform, Skylight, enhances the capabilities of hands-on workers to measurably and immediately improve business operations from the factory to the warehouse to the jobsite. To learn more, visit upskill.io.